The net force on an object is equal to the mass of the object multiplied by the acceleration of the object. 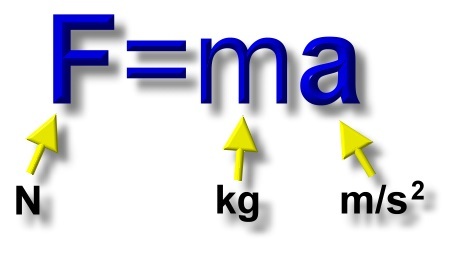 Force is measured in Newtons, N.
Mass is measured in kilograms, kg. Acceleration is measured in meters per second squared, m/s2. When you multiply a kilogram (mass unit) times a meter per second squared (acceleration unit) you get a kilogram-meter per second squared. So a unit for force is actually the kilogram-meter per second squared. However, no one really says that. The unit for force is named after Isaac Newton, and it is called the 'Newton', abbreviated 'N'. One Newton is one kilogram-meter per second squared. Here is a slideshow that shows three basic problems using F=ma. Also presented is the algebra used to rearrange the formula when solving for mass or acceleration. 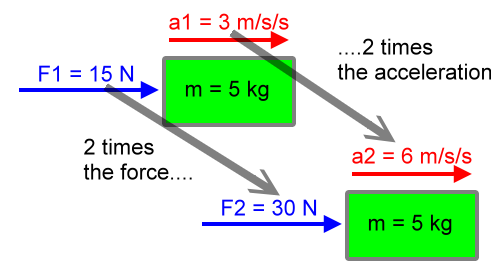 But how does an acceleration unit (on the left) become the same as a force unit divided by a mass unit (on the right)? All of this is explained in the following scrolling panels. Here are some problems that work with basic F=ma algebra. All of that is explained in the 'Calculating with F=ma' demonstration above. Each problem page has a back button that will return you to this page. Here we will show that in the equation F=ma the acceleration vector, a, has the same direction as the net force vector, F.
Now let's see how all this works out with the F and the a vector in the equation F=ma. Note that the right side of the equation is mass times acceleration. Mass is a scalar, and acceleration is a vector. So the right side of this equation is a scalar times a vector. This multiplication yields a vector that is called the force vector, or F, which is on the left side of the equation. And so we have shown that the formula F=ma contains the information that an object's acceleration vector is aimed in the same direction as its applied net force vector. There is a direct proportion between acceleration and applied net force. Information about direct proportions can be found here. Let's see if the equation F=ma contains the direct proportion between force, F, and acceleration, a. That is, does F=ma contain the information that acceleration is directly proportional to the applied net force? If acceleration is directly proportional to the applied net force, then by whatever factor acceleration changes, force changes by the same factor. To see this we will need to consider an object with constant mass. Let's consider an object with a mass of 5 kg. Clearly, both the acceleration and the force on this object change by the same factor, 2. These matching factor changes would occur for any factor change and for any constant mass. So the equation F=ma contains the direct proportion between acceleration and the applied net force. Now, what about the inverse proportion between acceleration and mass, is that contained within F=ma? Information about inverse proportions can be found here. Let's consider two situations, each with the same applied net force, say 6 N. That is, object 1 will have a net force of 6 N applied to it, and so will object 2. Clearly, the acceleration and mass change by reciprocal (or inverse) factors. The factors are 3 and 1/3, respectively. Since these two quantities change by reciprocal (inverse) factors, these two quantities are in an inverse proportion. There is really nothing special about our choice of factor changes here. Try changing the mass by a factor of 5 and calculate to see the acceleration change by a factor of 1/5. Looks like the formula F=ma contains both the direct and inverse proportions we described in our main Newton's Second Law of Motion page. Let's see how F=ma works itself into the kinematics formulas for accelerated motion, effectively changing kinematics into dynamics. Information about equations for accelerated motion can be found here. Would mean 'velocity initial' or 'the initial velocity'. Would mean 'velocity original' or 'the original velocity'. Hopefully the above will clear up any problems over the way that these equations are presented on the Equations for Accelerated Motion page and the way they are presented here. Example problems follow. Knowing an object's mass and the net force on it is as good as knowing the acceleration of the object. Divide the net force by the mass, and you will find the acceleration of the object. Once the acceleration is known, you can use the kinematic equations to discover the motion which the object will undertake. With all of this you can figure out where things are going and when they will get there. Thank you, Isaac Newton. Let's note the substitutions in the following kinematics equations. Displacement equals the initial (or original) velocity multiplied by time plus one-half times the acceleration multiplied by time squared. The final velocity is equal to the initial velocity plus the acceleration multiplied by time. The square of the final velocity is equal to the square of the initial velocity plus two times the acceleration times the displacement. Following are some example problems showing how the above substitution allows us to understand the motion of an object and the forces causing its motion. The parameters for each example can be modified with the 'less' and 'greater' buttons. Adjust them to see how the calculations work in several situations. It's a concise and sufficient statement of Newton's Second Law of Motion. In vector form (F=ma, bold quantities are vectors) it shows that acceleration and the applied net force are parallel vectors. Keeping the mass constant demonstrates a direct proportion between acceleration and the applied net force. Keeping the force constant demonstrates an inverse proportion between acceleration and mass. And of course, you can navigate with the kinematics equations. Just have your mass and net force handy so that you can calculate the acceleration.